So for the past few weeks I've been working on the early stages of a new model-making project. Late last year I got a few weeks experience of model-making in a company in Dublin called Modelworks Media. The project was huge (See: Frank Ghery and Norman Foster's plans for Battersea Power Station phase III) and there was an incredible team of people working on it. Most were temporary hires like myself, mainly recent graduates from either model-making or industrial design courses, but the main staff of the company were a really skilled team from whom I learned a lot of new skills in a relatively short time. I've had an interest in model-making for many years and decided to scratch that itch with a project of my own. I've started work on building a reproduction model of a minor landmark in Dublin city centre, that being a Victorian Kiosk by the lake in St. Stephen's Green, precisely the one pictured below. Built in 1898 this kiosk is probably a little less famous than the bandstand on the other side of the green. The structure is more humble in it's ornament and material than it's cohort, being an almost entirely wooden structure. That being said it's a little grander in scale with the original plans even prescribing a 7-bay-wide structure as opposed to the 5-bay-wide that eventually got built. 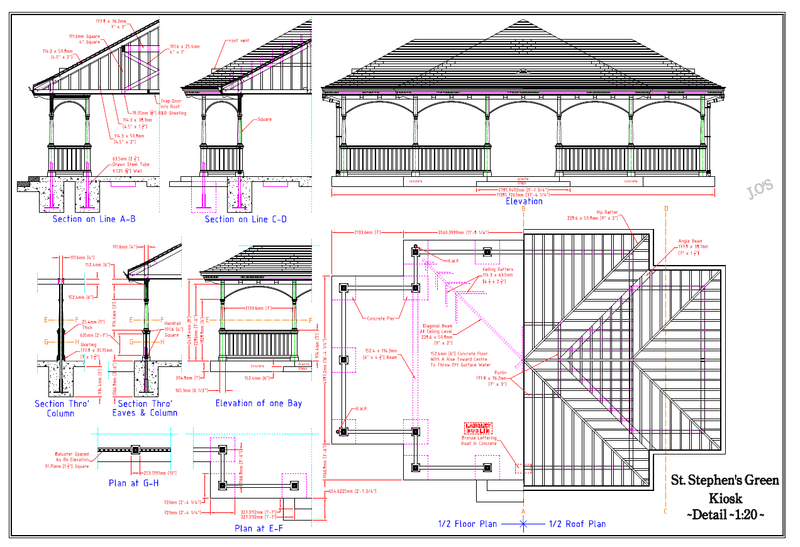 The original plans also had designs for an integrated bench to be built in the centre of the kiosk, which as far as I can tell was never realised. One of the reasons I know all this about the original plans for the kiosk is that I really stepped up my research game on this project and got a readers ticket for the Irish National Archives. This is a fantastic (and not to mention free) resource for research purposes and they hold many of the drawings of the OPW in their archives. Here I found the original OPW drawings (OPW/5HC/4/939), one or two images of which I hope to reproduce in small part here with permission from the archive. The drawings are marked with the initials HWL that I've yet to match to anyone in the City Architects Office or the OPW from that time, though that search continues. One thing I do know about HWL is that he had very accomplished penmanship. I have, in a way reproduced these drawings myself, which brings me to the next part of the post. For the purposes of the model I though it would be prudent to make drawings of the buildings through which I could initially record details that I could later use in the building of the model. Taking my cue from the original plans, which I was allowed to photograph in the archives, I began drawing up the plans using the thoroughly modern AutoCAD. I also used photographs I took of the Kiosk for reference during this process and must thank the utterly wonderful Irish Architecture Foundation for giving me a loan of their SLR when I made a plea across twitter for some kind soul to lend me a decent camera for this purpose. The original drawings were rendered in Inch scale and 1":4' and all the measurements were in imperial units so I first set about redrawing it with metric equivalents. 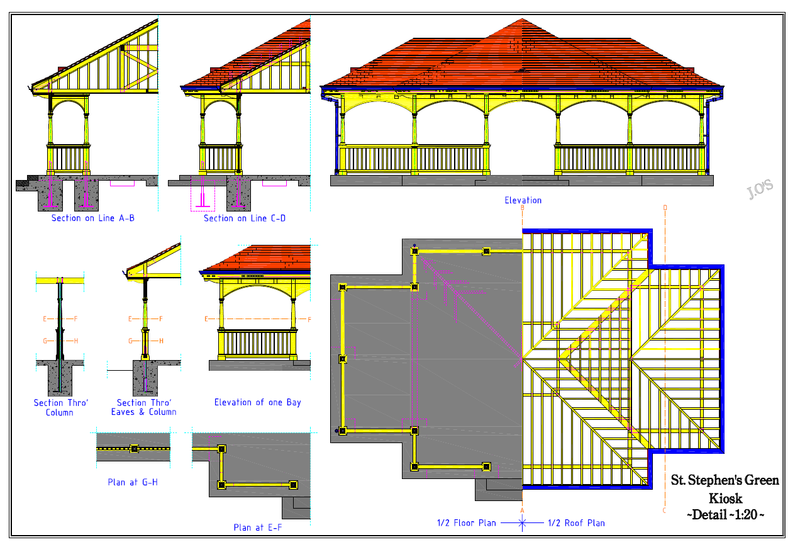 Apart from the planned bench mentioned earlier there were a few other minor alterations from the proposed plans most notably a simplified moulding profile on the fascia at the eaves and the position of the downpipes from the gutter. The drawings I've produced are representative of the actual existing structure and include one quite lovely detail not included in the original drawings, that being the bronze inset lettering naming (I assume) the contractor that, at the very least, laid the Concrete plinth if not building the whole structure. These new drawings combine recreations of all the views found on the two original drawings including a front elevation, split floor and roof structure plan, Lateral sections through the eaves, columns, central roof structure and projected roof structure and transverse sections through the upper column and the lower column and balusters. Having created a spreadsheet for the purposes of converting the imperial measures to metric and vice versa for the measurements I took myself I made it extra unwieldy by then working out the equivalent measures in scales ranging from 1:5 to 1:75. 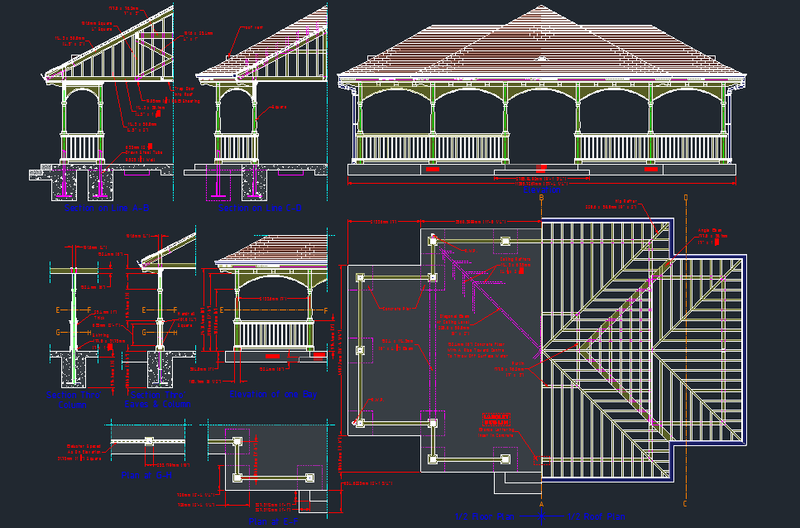 The two determining factors I used to chose the final scale were the overall size of the model (can't be too big) and the size of the smallest essential element the balusters (can't be too small). From this and based on the smallest square sectioned balsa I could find I settled on a scale of 1:20. Though satisfyingly for me this is the Lego "miniland scale", that being said it's not incredibly popular in general. In the US 1:24 would be a common architectural scale particularly for interiors and 1:22.5 is known as G-scale in model railway building. However, I felt even the difference between 1:20 and 1:22.5 made the balusters too small to recreate using readily sourced material. The widest part of the final model should be a little over 500mm (about 20" for those of an American or classically trained persuasion). I have already searched and though not thick on the ground 1:20 parts such as figures and other scale objects can be found should I need them. Now to the final show, I created two sheets in AutoCAD and discovered that at a print scale of 1:20 I could fit all the views I had drawn on an A0 sheet in a pretty logical and not too over crowded arrangement. While this is sort of un-necessary it adds a layer of security to the process allowing me to check pieces against the drawing for a quick reference that they're being built to the right size. While I can measure off this drawing, this will only be done to double check a measurement roughly with the spreadsheet being my first point of call when setting the callipers. I also wanted to pay homage in a way to the original plans, which were really beautifully rendered. My final reason is that though I'm not an architect I have been creating plans since I was quite a young child and I still find them fascinating artefacts. The progenitors to some of the most enormous creations of us human folk and invaluable tools of communication they're often the important bridge between the creative process and the technical details. I have copybooks going back 20 years to school, full of house plans, boat plans, bus plans, even more than a couple (an entire notebook) of starship plans (Oh yeah!). So below are the drawings produced for this project. They're both identical in layout however one has all the dimensions and annotations applied and the other is colourised to match the original drawings. I have a third copy of the dimensionless version due to a print mishap which resulted in it being printed without the colour layer. The print shop gave me this copy for free so I eventually plan to hand colour it to more faithfully reproduce the originals. You can click on the images below for higher resolution versions. For bandwidth's sake you can assume it's not the whole A0. Having gotten the project to this stage I'm extremely eager to start building, however I wont be able to start quite just yet. I'll explain this more in my next post which will be coming very soon. For now I've got the plans hanging on the walls where I work as a reminder that the project is ongoing and also because they look pretty damn cool.